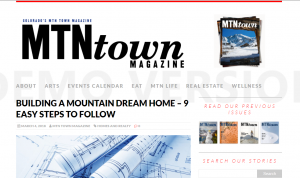 We are happy to announce that we are now published in Mountain Town Magazine: Building a Mountain Dream Home. This article is a brief introduction to the world of building a home in the Breckenridge, Colorado area. Of course, we had to summarize in many areas, and provides a general overview of the process. Many families are waiting and looking for the right property to come on the market, while others are creating their own dream home. Please read the article to hear Dina’s thoughts on building, new construction and options for Summit County Real Estate. Included below is a snippet from the article. Please check it out and if you have questions about anything, please feel free to contact us to learn more. Thanks for coming by the blog! Click here to see the article: REAL ESTATE – Building Your Dream Home, and click here to see the online version on Mtn Town Magazine’s website. Many families and investors are choosing to design what they want and Building A Dream Home instead of choosing a Real Estate listing in our mountain town communities. They love the idea and ready to walk into a fresh new build with all the latest features and design trends. New home construction permits are at an all-time high in Colorado’s mountain town communities, especially in Breckenridge and Silverthorne for this very reason. The biggest thing to remember is that this process will take time. Always keep in mind that if someone tells you it will take x amount of days be prepared for the time frame to get delayed for a variety of reasons (weather, permits, shipping, labor are a few of the reasons). If it gets done earlier than anticipated you’ll be happy and not disappointed that your expectations were not met. This is a process that certain times things are just beyond your control. If you get in a mindset that the completion date could be longer than first communicated then you will be better prepared for this journey. To keep you better prepared you should set up a good communication schedule with all involved. Communicate effectively and ask a lot of detailed questions with goals and dates, don’t assume anything. Set up in advance a communication schedule that works for each tradesman, contractor, architect etc. That way everybody knows about updates on what is happening and what the game plan is to resolve any issues at hand.